"There's no elf power. 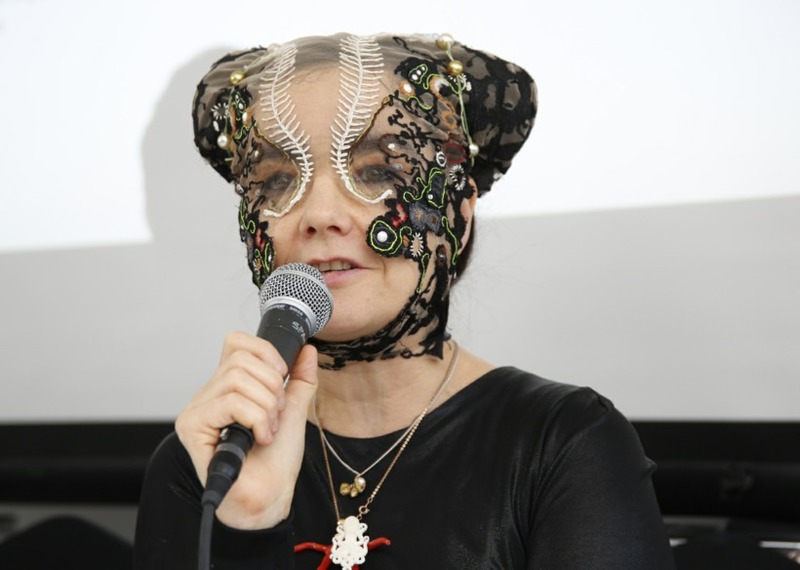 Iceland is a real place, with real waterfalls and real nature," said writer and activist Andri Snær Magnússon at a press conference with Icelandic musician Björk Guðmundsdóttir today at Gamla bíó concert venue. At the press conference, Magnason and Björk presented nature conservation society Gætum garðsins or Protect the park and their demand that the central highlands, or "the heart of Iceland" should be protected and made into a nature reservation to prevent the rise of further dams and electric cables in the highlands. "We ask the world to help us take a stand against our Government"
The general public in Iceland has eleven days left to protest the building of electric power cables across the sands of the central highlands. Magnason and Björk said that surveys showed that 80% of Icelanders were in favour of turning the central highlands into a reservation but that despite this, the government chose to go against the nation's wishes. Magnason and Björk therefore said that they decided to make a plea for help to the rest of the world through the number of international journalists present in Reykjavik for the Iceland Airwaves festival, to help fight the Icelandic Government. "We therefore ask the world to stand with us against our government." "We've seen this hype before." Magnason also made a point of a Reuters news story recently on the possibility of harnessing the power of Icelandic volcanoes to provide energy for Britain. "Well that's just superstition like elves and trolls," said Magnason smiling. "My grandmother has seen an elf but I'm not exporting him to Britain." He added that all rivers and waterfalls in Iceland would need to be harnessed to provide only 10 percent of the energy needs of Britain. "When we see headlines like that we get a bit scared. We've seen this hype before and we've seen the damage that harnessing this power can cause. It's worrying that the world believes it can get volcanic power without any repercussions." Björk Guðmundsdóttir harshly criticised the Icelandic Government when answering questions from the press. She pointed out that the Government still had two years in power which meant that they could do irreparable damage to the highlands. When asked by a reporter on her biggest global environmental concerns Björk replied that she's concentrating on Iceland. "I'd rather be at home writing songs. But life is short. I've decided to put all my power into Iceland, and all my spare time. " Watch Björk at the press conference here below. To find out more visit Heart of Iceland or the Facebook page HERE.